The Colca river begins high in the Andes, at Condorama Crucero Alto, drops down to the Pacific in stages, changing its name to Majes and then Camana as it goes. Where it runs between the tiny mountain villages of Chivay to Cabanaconde is a deep canyon known as the Colca Canyon. This canyon is reportedly the deepest in the world, thought to be twice as deep as the Grand Canyon in the USA. Unlike most of the Grand Canyon, portions of the Colca canyon are habitable, with pre-Colombian terraced fields still supporting agriculture and human life. The river and valley were well-known to the Incas and their predecessors, and the Spaniards laid out townships along the valley, no doubt planning to use Rio Colca valley as the route to Cuzco and other Andean locations. They built churches along the way, notably the one at Coporaque, but for some reason, the towns never grew and the route faded from outside memory. It wasn't until the early 1930's that the Colca valley was explored again, this time for the American Geographical Society. Colca Valley has been known by different names: The Lost Valley of the Incas, The Valley of Wonders, The Valley of Fire and The Territory of the Condor. It has even been called one of the Seven Natural Wonders of the World." 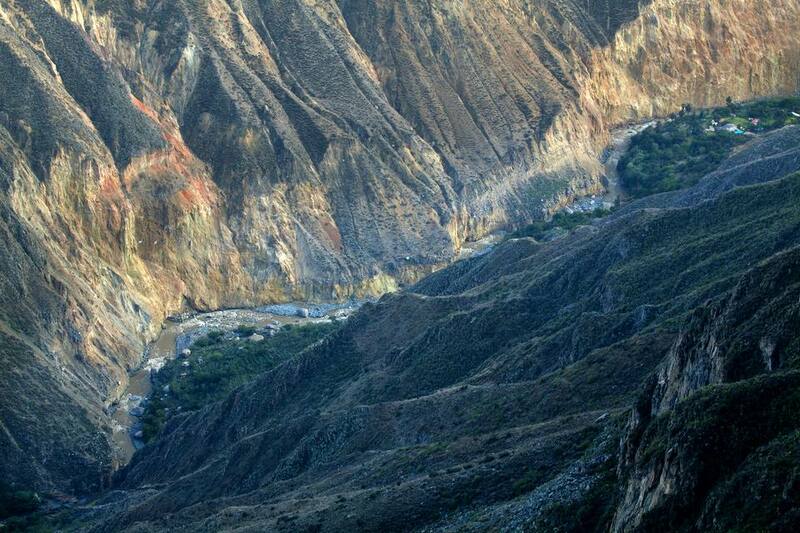 In the 1980's, with the Majes Hydroelectric Project, roads opened the Colca to the outside. One of the attractions to visitors is a glimpse into a way of life that has endured in isolation for centuries. Access now is usually from Arequipa, the second largest city in Peru and often called the Ciudad Blanca (White City) for the white volcanic ashlar stone used for building. Arequipa is about three hours by bus or van. Tours can be arranged in Arequipa if you are not already with a tour group. Busses go to Chivay and Cabanaconde on either end of the canyon, and you can begin your visit from either location. Many visitors choose to travel to Chivay in the afternoon, spend the night there acclimatizing to the altitude, and then tour Colca Canyon the next day. No matter what else you do, a highlight of the Colca Canyon is a stop at Cruz del Condor, the pass where condors soar gracefully on the rising thermals occurring as the air warms. You'll want to be there early to see the condors in flight. They hunt in the morning or late afternoon and watching them is an unforgettable experience. There are no railings, and the floor of the canyon is 3960 ft (1200m) below the viewing area, so please watch your step. In addition to the Colca Canyon, the La Calera hot springs at Chivay are a wonderful way to relax after a day's touring, and the Toro Muerto cemetery of the Wari Indians. The final resting place of these Indians, buried in a fetal position, is built in a 90° steep cliff face and seeing it, you wonder how the burial party managed. If you plan to hike or trek in the canyon, be sure to take time to get used to the altitude and take provisions with you. Take cash, as ATMs and traveler's checks are not used in the small towns of the area. Make sure you protect yourself from the sun at high altitude with a hat, sunscreen, and sunglasses. Do not let yourself get dehydrated. Take your own water or water purification pills or equipment. You'll want a good camera and lots of film to take a photo of the great views. Rafting on Rio Colca appeals to many travelers, who appreciate the thrills and the super view from the river up the canyon walls. Others like to bike along the canyon roads. Colca Canyon can be visited any time of year, but it is most beautiful, and safer, after the rains cease. Live volcanos are nearby, and seismic activity can cause landslides or otherwise make the ground unstable. Volcan Sabancayo is more active than Ampato, which you may recall as the site where the now famous Ice Mummy was found.